The characters, using unique, photo-realistic methods, were modelled to be surprisingly realistic. Giving these characters their movement was the job of the motion team. The movements of the Shibito, who are no longer human, were created using novel techniques. 01 - An image of motion capture underway. Shows a scene of Kyoya leading Miyako by the hand. 02 & 03 - Being shot by half-Shibito-turned Officer Tetsuo Ishida. 04 & 05 & 06 - Character movements were generally taken from motion capture, but the movements of the no longer human Shibito had to be created from scratch. 07 & 08 - Applying movements to the characters' 3D models using development tools. 09 - Apart from motion capture, things were also acted out for storyboards. In current game development, character movement is most commonly created using technology. Performers called motion actors wear suits with markers on them to record their actions, and the movements of their bodies as they perform are traced over directly. Siren also employs this method of motion capture in order to give the 3D models of its characters their movements. From basic movements to intense action, it creates convincingly natural human movements. Also, since the image behind the movements of men and women are clearly different, male characters were acted by men and female characters acted by women, and each of the actors who were photographed for their in-game models performed the movement for their own character. On the other hand, the movements of the Shibito, beings from "another world", were done by Ikko Tamura and Yuko Kobayashi, members of Dairakudakan, a long-standing avant-garde dance troupe. By making them seem clumsy, and leaving a sense of humanity, the Shibito's unique movements were created. The movements of all of the characters had fine-tuning performed on them using the motion capture data with development tools, completing them. Furthermore, prior to applying the markers to record motion capture, theatre rehearsal-style scenes were acted out. 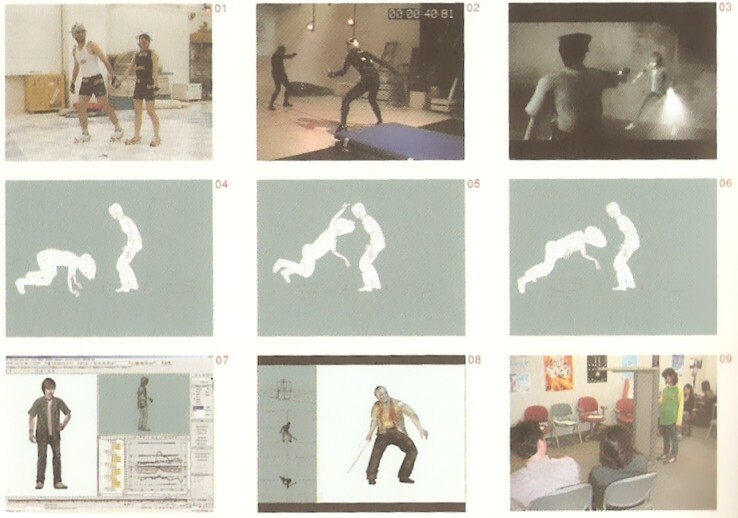 These were used for cutscenes in the game and to refine the storyboards for it, and helped in figuring out the basic movements that needed to be done for motion capture. As you can see from picture 9, most of the scenes in the game were performed this way (the photo shows Tomoko knocking on the window from outside the church. You can see that at this point, they were using an upturned desk in place of a window).